China is known as the world’s hub for production of fake goods. Counterfeiting everything from electronics to clothing and more sinisterly, drywall and milk powder, is an ongoing problem that needs to be addressed. Fortunately the Chinese government is becoming more active in cracking down on individuals involved in intellectual property theft and the production of harmful goods. Counterfeiting also happens at the urban scale in China. Recently developers from Guangdong Province have taken to planning an exact replica of the Austrian Alpine village of Hallstatt. Unlike producing fake consumer goods, the legality of appropriating architectural styles from overseas is not clearly defined. In the case of Hallstatt there may be some legal grounds against the Chinese developers due to the village’s status as a UNESCO Heritage site. The copying of Hallstatt is an extreme example of Chinese developers using European architectural styles to market new projects. In almost every city, developments abound that boast of their ‘luxury British style villas’ or promote a ‘Mediterranean lifestyle’. To be sure, China is not the only country that borrows from Europe when it comes to architecture. In the U.S., places like Las Vegas and Disneyland are notorious for featuring fantasy interpretations of charming European motifs. Yet the proliferation of these fantasy-land projects is even more curious in a place like China, which has a 5,000 year history and its own treasure trove of architectural heritage from which to be inspired. Walking among a new development in Chengdu styled after a Bavarian village last year, I was taken aback by the stark bizarreness of such a project. Detached from anything remotely related to Chengdu or China, the experience left me wondering where the cultural soul of the country had gone. Now before I am accused of being just another foreigner romanticizing for the ‘old’ China let me clarify that I understand that in the path towards modernization, aspiring Chinese urban dwellers have a right to experience the fruits of the developed world. Furthermore, no one has a monopoly on architectural taste. Yet it is a bit unnerving to witness a society moving forward so out of touch with its own history. 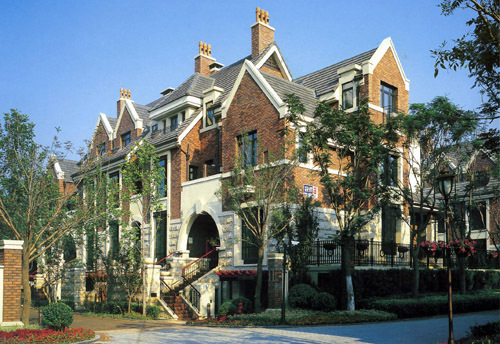 When I’ve asked Chinese architects why the development of European-style buildings is so popular, the response is usually two-fold: for one, this is what newly rich Chinese home buyers want and two, it is easier and cheaper for developers to build than an accurate representation of a historical Chinese style- which require a lot more attention to detail. You can’t argue with property developers for giving the people what they want. But we can ask, at least rhetorically, why is this what the people want? Again, it most likely is a result of China’s recent contentious relationship with its own history and culture. It is clear that the country has still not recovered from the purging of China’s ‘Four Olds‘ (Old Customs, Old Culture, Old Habits, and Old Ideas) during Mao Zedong’s Cultural Revolution. The obsession with all things new or foreign is not likely to end anytime soon. Indeed, the desire for new things is so strong that oftentimes even buildings only 5 years old are considered old by Chinese urbanites. The contradiction between China’s extraordinarily long history and unyielding forward-looking vision is a conundrum. Yet given rising prosperity of a larger share of the population, it is likely that in the future, a more culturally confident China will be able to reconnect with its past and discover all the treasures that have been there all along but hiding behind the veil of progress and modernization. Howard Mark - The question of why can be answered in this manner. The country has been sequestered for most of its history with the exception of the European and American influence in the 20’s and 30’s and this was not by choice. The addiction to opium brought in by the British from Afghanistan as payment for tea when the British silver reserves were becoming scarce was the west abusing the generosity of the Chinese to export their tea. take on the American economy. Yah makes things and yah sells em.